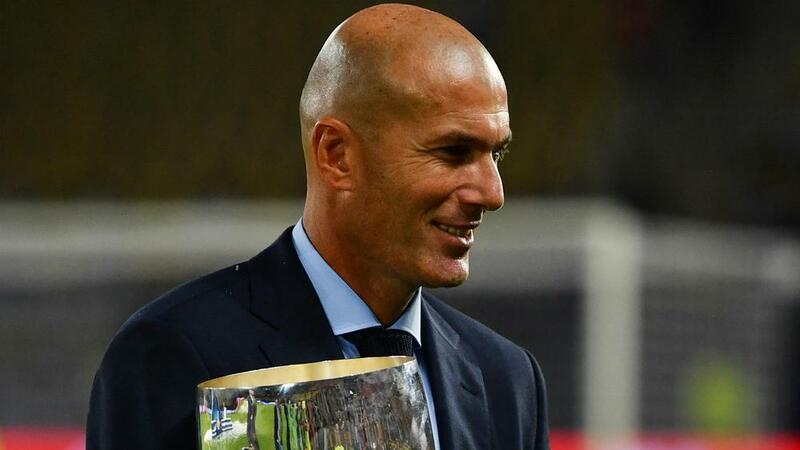 Zinedine Zidane said Real Madrid are hungry for more silverware following their UEFA Super Cup triumph over Manchester United. Casemiro and Isco were on target as LaLiga and Champions League winners Madrid defeated Europa League titleholders United 2-1 in Skopje on Tuesday. Casemiro opened the scoring in the 24th minute and man-of-the-match Isco doubled the lead seven minutes into the second half before Romelu Lukaku reduced the deficit just past the hour-mark. Madrid held on for their third Super Cup trophy since 2014. "We know we've got a lot of talent and that with hard work we can achieve great things," head coach Zidane said. "We're very hungry, we always want more. "It was a near perfect performance. The first half was fantastic and then we struggled a bit at the end of the second. If we'd have got the third goal, that would have been it. We showed great character and hunger. "There were great celebrations in the dressing room, that's normal, we never get tired of winning. We controlled things where they are very strong, such as second balls, the high balls. We pressed high and didn't allow them to play. We made it count with the ball and stayed calm. The team's overall commitment is crucial as well." Zidane, whose side scored in their last 66 games in all competitions, added: "We know that every game will be more difficult and we'll come up against very good opposition throughout the season. The first comes on Sunday. "We want to give it our all and we've got the ambition to do better and better. Today was no comparison with the pre-season games. We were on it from the first minute to the last."